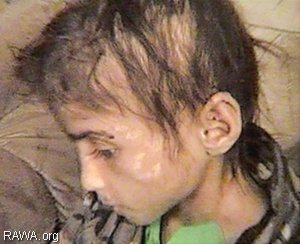 7 year old Samia has a shocking story. She is one of tens of thousands of Afghanistan's girls who fall victim of family violence in the male-chauvinistic society where fundamentalists promote and support dirty misogynistic customs. 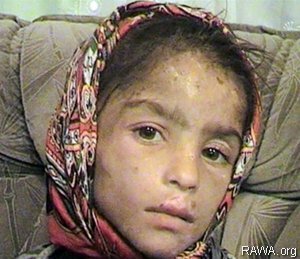 Two years ago, the father of Samia raped a 10 year old daughter of Mohammad Yassin in Baghlan province in northern Afghanistan. When he was arrested, according to the customs of that area which are called “Bad”, he is asked to give his daughter to a son of Mohammad Yassin, so the issue could be settled. He gives Samia to Mohammad Omer (son of M. Yassin) to marry. Then Samia is taken to the house of M. Yassin where she is regarded as a slave and for two long years experiences every kind of torture and discrimination. The family daily beat the innocent child and locked her down in a dark basement. They injured her body by using hot metal pieces, pulled her hair, kept her naked and force her to stay outside in the freezing weather for hours and many other such bestial punishments. Finally, some people of the area came to know about the crimes being committed against the child and they decided to release her from the horrible sufferings. The people forcibly entered the house and brought Samia out and handed her over to the security officials. M. Yassin and his son ran away and the people couldn't arrest them. In a country where warlords and Jehadi mafia dominate the whole society and the most dark-minded fundamentalists are in power, there is no law and order to prevent such terrible crimes. Inhuman customs and family violence can easily target innocent children and women when these victims are not supported by executive, legislative and judicial bodies. In Afghanistan most of those involved in these type of criminal acts are the US-backed warlords who have guns, power and official posts so that no one can stop them. UNIFEM: "65% widows in Kabul see suicide the only option to get rid of their miseries"